I have really had my eyes opened lately. First it was reading a study done in 2011 that stated that the average youth 19 years and younger spends an average of six hours/day on computer/video games and TV. It went on to state that an “indoor childhood” trend is occurring and it is affecting the mental, emotional and physical areas of children’s lives. This was followed up by a study given to me by the amazing Gemma Stone who is a wonderful psychologist. It was from a 2009 article published in Psychology Today that used a term called Nature Deficit Disorder. This is not a formal diagnosis, but instead “a way to describe the psychological, physical and cognitive costs of human alienation from nature, particularly for children in the vulnerable developing years.” It goes on to reveal that The Outdoor Foundation did a survey that showed “a decline of more than 11% of participation in outdoor activities among young people age 6 to 17, with the sharpest decline among youngsters age 6 to 12.” They already knew that within the last 10 years children were becoming less connected with nature, but this study revealed a decline of 11% in one year alone. What scares me even more about this statistic is this study is four years old and we all know how much technology has increased in the past 4 years. 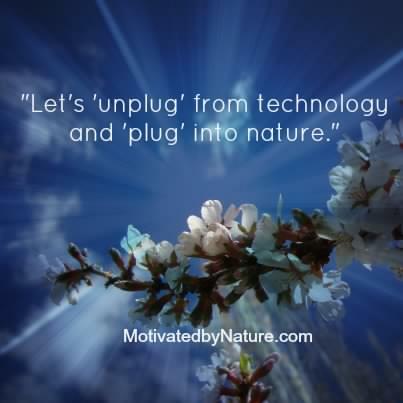 I am not trying to say that technology is bad, I just want to bring awareness to the disconnect that is occurring between technology time and nature time. On a recent walk, I was enjoying the robins chirping their happy tunes and the wind rustling through the leaves. I was taking in all the amazing sounds and beauty that surrounded me. As a side note, the three most soothing sounds to the human ear are wind, water and birds.During my walk, a lady passed by me with her head down and i-Pod on. She had no idea what incredible sights and sounds were around her. She was plugged into technology and unplugged from nature, even though she was walking in it. It is my belief that as caregivers, we have a responsibility for instilling that love of nature at a young age which will also help with the proven mental, emotional and physical benefits of connecting with nature. I am curious, what are your thoughts?